Baby Abigail ran out of patience Thursday when she made her debut en route to Manhattan. It was a typical day in New York City. The morning commute was in full swing. A 29-year-old woman, from Queens, (who has not been named) was sitting in a taxi, traveling from her mother’s house in New Jersey into Manhattan. She was headed to a hospital appointment in anticipation of her Friday due date. But, the baby had other ideas. 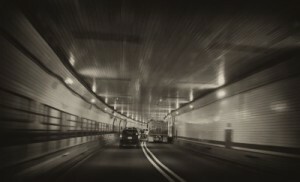 Caught in a steady stream of traffic, approaching the Lincoln Tunnel, the woman went into labour. Realizing he was out of his depth, the cab driver pulled the car over at a Port Authority police post within the toll booths. Officer Kevin Leonard called over to headquarters, where he reached Officer Richard Kuncken. Officer Kuncken is a man of many talents. He is a licensed paramedic and is actually the officer charged with teaching recruits how to handle an emergency birth situation. He was the ideal man for the job. The headquarters is right across the street from the Port Authority post where Officer Leonard and the labouring woman were located. But, at 8:30 a.m. the commuter traffic presented an obstacle that made response by road an unattractive option. Instead, in true Gotham City superhero style, Officer Kuncken rushed through a passageway under the street and was able to respond in a minute. The officers attended to the baby, (drying her, warming her, and cutting the umbilical cord) until the ambulance arrived to take the newborn and her mother to Hoboken University Hospital. Mother and child are doing well. Officer Kuncken is an eight-year-veteran of the Port Authority and recalls that there was another birth near the Lincoln Tunnel about six years ago. Chinese Mom Welcomes 15lb Baby! Some women have no decency or pride. They do not care where their babies are born or who delivers them. They seem to want public births and do not care about babies safety or the mess someone has to clean up.